After the fall. Down the long centuries after the Flame Deluge scoured the earth clean, the monks of the Order of St. Leibowitz the Engineer kept alive the ancient knowledge. In their monastery in the Utah desert, they preserved the precious relics of their founder: the blessed blueprint, the sacred shopping list and the holy shrine of Fallout Shelter. Watched over by an immortal wanderer, they witnessed humanity's rebirth from ashes, and saw reenacted the eternal drama of the struggle between light and darkness, life and death. A profound and darkly comical dystopian novel that resonates with the reader for years to come. When I read about Presenting Lenore's Dystopian August event, I immediately wanted to reread this sci-fi classic. I originally read this book twenty years ago and have never forgotten the experience. A Canticle for Leibowitz is a post-apocalyptic tale that is at once philosophical and darkly humorous. It is not often that an author can achieve hilarity in a dystopian novel, yet I often found myself laughing at the absurdity of these poor characters. This novel illustrates the human need to find order in one's environment even when the slate has been, quite literally, wiped clean. In this vision of the future, a nuclear holocaust has laid waste to the planet and the few survivors are left with very little written history. This is also compounded by the backlash by the majority of the remaining population to destroy all science and knowledge. A monastic order, founded by the former scientist Leibowitz, have the "sacred shopping list" and the symbol on the door of a fallout shelter, but no context within which to understand what these words and symbols mean. Miller deftly weaves a superstitious society which, very believably, iconifies these items and creates an entire religious belief system upon them. An enjoyable, thought provoking classic. I would recommend A Canticle for Leibowitz to fans of fantasy, science fiction, and especially to fans of thought provoking dystopian novels. A Canticle for Leibowitz on Amazon . 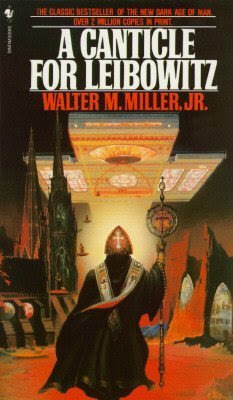 A Canticle for Leibowitz on Goodreads. If you are interested in learning more about Dystopian August, please visit the list of reviews at Presenting Lenore. I read "Canticle" my junior year of high school as part of my honors English class (we had the coolest teachers), and I have never forgotten it. I finally found a copy in a campus bookstore, and spent all my coffee money for the day on it. It's a seriously excellent read, and I would recommend it to anyone. Oh yes. I read this one. I know some people think the book doesn't have as much meaning to the way of the world now as it did when it was writen. But I think it does have a great point that it touches on. Great book. Historical, yes. But it is a great fantasy read and wonderful idea of a thought.